Kitchen Remodeling: Fall in Love With Your Home This Valentine's Day! Love is in the air, and here at Kiba Studios, we couldn’t be more excited. We’re helping homeowners in Long Island and Twin Falls create the homes of their dreams, and we would love to help you, too! In today’s post, we’ll provide you with a bit of information about Mid Continent Cabinetry, one of our premium cabinet suppliers. We’ll also explain how our kitchen and bath remodeling experts can help you fall in love with your home this Valentine’s Day! Read on to learn more about our products and services, and get started with a free project estimate on this page! Kiba is proud to supply Mid Continent Cabinetry’s kitchen and bathroom cabinets. As the fifth-largest cabinetry manufacturer in the United States, having Mid Continent Cabinetry products in our showroom means that you have a wide variety of options when you walk through our doors. 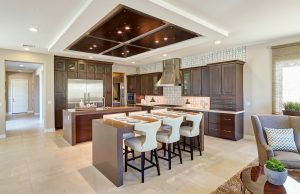 They produce both stock and custom cabinetry, ensuring that you’ll be able to find the ideal cabinets for your new kitchen or bathroom — no matter what your needs may be. Mid Continent Cabinetry has implemented four-day work weeks in order to reduce their total energy consumption and waste production. This measure also improves employee welfare and promotes a healthy work-life balance. They utilize 100-percent recycled materials for all of their packaging, use exclusively recycled paper for printing, and reuse outdated printouts. The cabinetry manufacturing process inevitably produces waste, but Mid Continent Cabinetry minimizes their waste by reusing scrap metal, extra wood, paper, plastic, glass, and other recyclable materials. In short, you should feel great about your decision if you purchase cabinets from Mid Continent Cabinetry! For more information about this exceptional company, please get in touch with a member of Kiba. They say it takes time to fall in love, but at Kiba, we respectfully disagree. This Valentine’s Day, we want to help you become enamored with your new kitchen from the moment you see the initial design. Whether you want to update your home’s look with new kitchen cabinets, or you want to build an entirely new space from scratch, our talented kitchen designers will help you create the space you’ve always wanted! Be warned — you may never want to leave! You can view a few of our many kitchen cabinet options on this page. Come by our showrooms to view our full selection! There’s nothing quite like a luxurious bath on Valentine’s Day, so take this opportunity to create the bathroom you deserve! From updated countertops and cabinetry to new fixtures, and all of the small details in between, this Valentine’s Day might just be the best one you’ve ever had. A bathroom remodel is the perfect way to tell yourself how much you matter, and we’re willing to bet that your significant other will appreciate your new space, too! We hope that today’s post will help you take the first steps toward the home of your dreams. Be sure to check our blog page frequently, as we’ll be highlighting more of the manufacturers and products we carry in the coming weeks and months. If you’re ready to fall in love with your home this Valentine’s Day, then come by a Kiba showroom to speak with our talented bathroom and kitchen design experts! We’ll help you find the perfect products for your home, and we’ll always work with you to find options that fit within your budget. Are you too busy planning what you’ll do for that special someone in your life to come to a showroom? No problem! You can get started with a free project estimate on this page, or you can begin designing your kitchen online through this page! A Kiba designer will reach out to you with your next steps, so be sure to keep an eye on your email. Happy Valentine’s Day from all of us at Kiba Studios! We can’t wait to work with you.